Custom motorized bicycle companies seem to be popping up everywhere, but no one is building fresher looking bikes than the guys at Imperial Cycles. Created by Eric Soriano and Jerome they describe their company as “constantly pushing envelopes, opening new doors, and boldly going there. Inspired by the 1920’s board track racers our bike designs incorporate a fresh look using new bike technologies, and innovations”. The bike pictured is their popular ‘Bullet’ and comes with a Vintage Schwinn frame, bare metal tank, aluminum mags, Brooks Saddle, Quill Stem, Oury grips, shortened bars and a dropped springer to give it a lower, more aggressive stance. The ‘Bullet’ sells for a very reasonable price of $1200 and it looks like they ship these bikes worldwide. If you are interested in seeing more from Imperial, check out their Blog which showcases the other models they are building. Came across these guys in my travels. 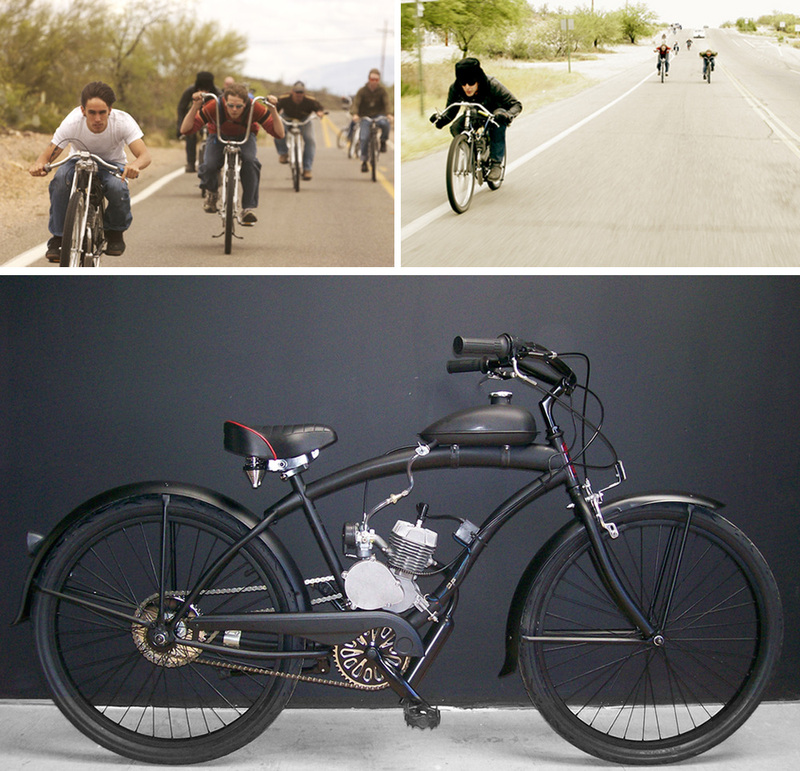 They are called Spooky Tooth Cycles and are based in Tuscon Arizona. By combining standard bicycles with small two stroke engines, Spooky Tooth are creating some cool looking motor-cycles for their own thrill seeking purposes. They even fought the law in Arizona (and won) to have these bikes legal without registering them. Check this link to read more about that story.